This article is about the radio show. For the film, see A Prairie Home Companion (film). A Prairie Home Companion is a live weekly radio variety show hosted by musician and songwriter Chris Thile. The program was created in 1974 by Garrison Keillor, who hosted it until 2016. It airs on Saturdays from 5 to 7 p.m. Central Time from the Fitzgerald Theater in Saint Paul, Minnesota and is also frequently heard on tours to New York and other US cities. The show is known for its musical guests, especially folk and traditional musicians, tongue-in-cheek radio drama, and relaxed humor. Keillor's wry storytelling segment, "News from Lake Wobegon" was the show's best-known feature during his long tenure. Produced by Prairie Home Productions and distributed by American Public Media, A Prairie Home Companion is most often heard on public radio stations in the United States, reaching an audience of over 3 million listeners. The show has a long history; it has existed in a similar form since as far back as 1974 and borrows its name from a radio program in existence in 1969 that was named after the Prairie Home Cemetery in Moorhead, Minnesota, next to Concordia College. The radio program inspired a 2006 film of the same name, written by Keillor, directed by Robert Altman, and featuring Keillor, Kevin Kline, Lily Tomlin, Meryl Streep, and Lindsay Lohan. In 2015, Keillor announced that he would step down from hosting the program and designated Chris Thile as the new host; Keillor will continue on as the show's producer. On July 1, 2016, Keillor's final episode of the show was recorded live at the Hollywood Bowl in California for an audience of 18,000 fans and was broadcast on July 2, 2016. Thile made his debut as permanent host on October 15, 2016. 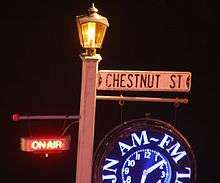 The earliest radio program to have the name bore little resemblance to the present Saturday-evening show. A Prairie Home Companion was originally a morning show, running from 6 to 9 a.m. on Minnesota Public Radio. After researching the Grand Ole Opry for an article, Keillor became interested in doing a variety show on the radio. On July 6, 1974, the first live broadcast of A Prairie Home Companion took place. That show was broadcast from St. Paul in the Janet Wallace Auditorium of Macalester College. Twelve audience members turned out, mostly children. The second episode featured the first performance on the show by Butch Thompson, who became house pianist. Thompson stayed with the program until 1986, and still frequently performs on the show. In 1978, the show moved into the World Theater in St. Paul, which was renovated in 1986 and renamed the Fitzgerald Theater in 1994. This is the same location that the program uses today. The show went off the air in 1987, and Keillor married and spent some time abroad during the following two years. For a brief time, the show was replaced – both on the air and in the World Theater – by Good Evening, a live variety show designed by ex-Prairie Home and All Things Considered staffers to retain the audience Keillor cultivated over the years. Many stations opted instead to continue APHC repeats in its traditional Saturday time slot. In 1989, Keillor returned to radio with The American Radio Company of the Air (renamed Garrison Keillor's American Radio Company in its second season), broadcast originally from the Brooklyn Academy of Music. The new program was a slightly revised format, with sketches and musical guests reflecting a more New York sensibility, rather than the country and folk music predominant in APHC. Also, while Keillor still sang and delivered a regular monologue on American Radio Company, Lake Wobegon was initially downplayed, as he felt it was "cruel" to talk to a Brooklyn audience about life in a small town. 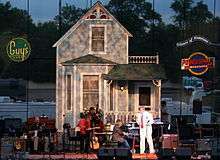 During this period, Keillor revived the full APHC format only for "annual farewell performances". In the fall of 1992, Keillor returned to the World Theater with ARC for the majority of the season, and the next year, the program officially reverted to the A Prairie Home Companion name and format. While many of the episodes originate from St. Paul, the show often travels to other cities around the U.S. and overseas for its live weekly broadcasts. Common road venues include The Town Hall in New York City; Tanglewood in Lenox, Massachusetts; Wolf Trap in Vienna, Virginia; Ryman Auditorium in Nashville, Tennessee; the Greek Theater in Los Angeles; and the State Theater in Minneapolis. There is also a show each year at the Minnesota State Fair. From the show's inception until 1987, its theme song was the Hank Snow hit "Hello Love". After 1987, each show has opened with the Spencer Williams composition "Tishomingo Blues" as the theme song, with lyrics written especially for A Prairie Home Companion. Greetings from members of the audience to friends and family at home (frequently humorous) are read each week by Thile just after the show's intermission, at the top of the second hour. Birthdays and anniversaries of famous composers and musicians are also observed. Keillor and the ensemble perform comedy skits, such as the satirical "Guy Noir, Private Eye", which parodies film noir and radio dramas. Guy Noir's popularity is such that the first few notes of the theme or the first lines of the announcer's introduction ("A dark night in a city that knows how to keep its secrets ...") often draw applause and cheers from the audience. Also regularly featured are the adventures of Dusty and Lefty, "The Lives of the Cowboys". In these skits, Dusty (Tim Russell) is a stereotypical rough-and-tumble cowboy, while Lefty (Keillor) is his sensitive counterpart. One of the show's best-known features is Keillor's "News from Lake Wobegon", a weekly storytelling monologue, claiming to be a report from Keillor's fictitious hometown of Lake Wobegon, "the little town that time forgot and the decades cannot improve ... where all the women are strong, all the men are good-looking, and all the children are above average". The opening words of the monologue usually do not change: "Well, it's been a quiet week in Lake Wobegon, Minnesota, my hometown, out on the edge of the prairie." Keillor often pokes fun at central Minnesota's large Scandinavian-American and German-American communities, and many of his fictional characters have names that reflect this. The "News from Lake Wobegon" does not have a set structure, but features recurring characters and places such as the Chatterbox Café, the Sidetrack Tap, Pastor Ingqvist of the Lake Wobegon Lutheran Church and his successor Pastor Liz, Father Emil of Our Lady of Perpetual Responsibility Roman Catholic Church (a parody of Our Mother of Perpetual Help), the Lake Wobegon Whippets sports teams, various members of the Bunsen and Krebsbach families, and an assortment of nearby "Norwegian bachelor farmers". Once a year the program featured a special "joke show", which generally included the Lake Wobegon monologue and musical acts, but with other skits replaced by the performers taking turns telling jokes. Humorists such as Paula Poundstone and Roy Blount Jr. often made guest appearances on those shows, and listeners and audience members were encouraged to submit jokes for use on the air. In-jokes are also sprinkled through the show, such as "Piscacadawadaquoddymoggin", a made-up word that's been used both for places and for people's names. The components of this made-up word are portions of Native American place names in the New England region of the United States, most of them in Maine (i.e. : Piscataqua, Passamaquoddy, and Androscoggin). A sign for "Guy's Shoes," one of A Prairie Home Companion's fictitious sponsors. Because A Prairie Home Companion airs on noncommercial radio, the program is forbidden to carry real advertisements. Instead, the show produces advertisements for fictional products, performed in the style of live old-time radio commercials. The show acknowledges its actual underwriters at the beginning, end, and middle (break) of the show. The jingle is usually sung after a bombastic, sound-effect-enhanced tale of woe, and is immediately followed by Keillor asking, "Wouldn't this be a great time for a piece of rhubarb pie? Yes, nothing gets the taste of shame and humiliation out of your mouth quite like Bebop-A-Reebop Rhubarb Pie." Other prominent "sponsors" include Bertha's Kitty Boutique, whose locations in the fictional "Dales" shopping centers ("Roy 'n' Dale, Airedale, Teasdale, Clydesdale, Chippendale, Mondale, and all the other fine shopping centers") allude to various real people and things, and The Catchup Advisory Board — its name a mashup of the common "catsup" and "ketchup" spellings — which has the tagline "Catchup: For the good times." Café Boeuf, a fictionally and exceptionally snobbish French restaurant in Lake Wobegon "where the elite meet to eat,"
Guy's Shoes — purveyor of Guy's All-Star Shoes, the Converse-like sponsor of the Shoe Band, which specializes in steel-toed shoes ("so even when you strike out [ping!] you can walk away"). Regularly appearing actors include Tim Russell and Sue Scott. During the show's season as The American Radio Company of the Air, legendary radio comedian Bob Elliott was a regular cast member. Bill Perry and Walter Bobbie were members. Ivy Austin was a regular contributing comedian (and vocalist) in the early '90s. Prudence Johnson has performed frequently on the show as an actress (and a singer). Mark Benninghofer joined the cast as a substitute actor for a brief time after Russell broke his ankle in February 2009, forcing him to take a month of medical leave. Erica Rhodes has been an occasional guest on the show, with her appearances beginning in 1996 when she was 10 years old. The late Tom Keith, also known as Jim Ed Poole, appeared in all of the home-based shows. Keith died on October 30, 2011 at age 64. Fred Newman filled this role in the away shows. Steve Kramer and Leslye Orr have also provided sound effects for the show. Regular musicians in Guy's All-Star String band include Richard Dworsky, a composer who appears weekly as pianist, bandleader, and music director, Gary Raynor on bass and bass guitar, Peter Johnson on percussion, Jevetta Steele on vocals, and Andy Stein on violin, tenor and bass saxophones, and vocals. When Chris Thile took over the show, he added bassist Paul Kowert, guitarist Chris Eldridge, and fiddler Brittany Haas. On January 15, 2011, the program was hosted by singer Sara Watkins of San Diego, California. The format was the same, but Keillor appeared only as a guest actor and to deliver the News from Lake Wobegon. He claimed he had taken the chance to see the show being performed for himself. It was reported that this could be the beginning of a trend toward Keillor's eventual retirement, and on March 16, 2011, Keillor stated in an interview with the AARP that he would most likely retire from the show by the time he turned 70 in August 2012. On January 29, 2011, Erica Rhodes expressed frustration over not being picked to guest host. On February 7 and 14, 2015, the program was hosted by mandolinist Chris Thile (like Sara Watkins, a member of Nickel Creek). As when Watkins hosted, the format remained largely unchanged, but Keillor did not make an appearance. Instead, storyteller Tristan Jimerson appeared on the February 7 show and comedian/storyteller Elna Baker on the February 14 show. Thile's band Punch Brothers performed on the February 7 show. Thile was named permanent host of the show in late June 2015. Keillor's last show as host was recorded on July 1, 2016, and broadcast the following day. Thile took over as permanent host on October 15, 2016. The show is distributed by Minnesota Public Radio's distribution arm, American Public Media, to more than 500 public radio stations in the United States as well as other outlets. About 4 million U.S. listeners tune in each week. The program is also carried around the world by the American Armed Forces Radio Network and America One. Sirius XM Satellite Radio carries the show via its XM Public Radio and NPR Now channels. Live video of the broadcast in progress is also streamed on YouTube and on the show's website. In Europe, the show is broadcast by WRN Europe on Sundays at 1100 UTC. NPR Worldwide, NPR's international radio channel, also broadcasts the full show at 1200 CET on the Hotbird satellite and NPR Berlin, Germany on FM. An alternative edition of the show is broadcast in the UK by BBC Radio 4 Extra, in the Republic of Ireland by RTÉ Radio 1 Extra, having previously aired in the 2000s on Dublin station NEAR FM, and on Australia's ABC Radio National under the name Garrison Keillor's Radio Show. This version runs approximately one hour and features the News from Lake Wobegon and selected musical acts and comedy sketches. Unlike A Prairie Home Companion, it has no station breaks. There are also no underwriting credits, as the BBC and ABC do not use underwriting to fund broadcasts (RTÉ normally does, but still broadcasts the same version of the show), though some of the program's fictional sponsors are still credited. Radio New Zealand National also carries the show from time to time. Owing to licensing considerations, most musical performances cannot be released outside of a broadcast or streaming agreement from music publishers, so the show is not podcast by itself, except for the "News from Lake Wobegon" segments. (Even performances of public-domain songs are covered under performance royalties if their performers are under contract.) Shows including musical performances are on the website in the Archive, but are playable only as a media stream for this reason. Released on June 9, 2006, A Prairie Home Companion is a film about a radio show modeled on A Prairie Home Companion. It was written by and stars Garrison Keillor, with Rich Dworsky as bandleader and pianist. Directed by Robert Altman, the film stars Kevin Kline, John C. Reilly, Meryl Streep, Lindsay Lohan, Lily Tomlin, Maya Rudolph, Woody Harrelson, Virginia Madsen, Tommy Lee Jones, and L.Q. Jones. Dworsky served as the film's conductor, arranger, and composer. The film depicts the show's behind-the-scenes activities and introduces its imminent, unexpected cancellation. It does not resemble A Prairie Home Companion exactly, notably excluding any reference to Lake Wobegon. 1 2 3 Associated Press, Garrison Keillor hosts final A Prairie Home Companion episode, The Guardian, July 2, 2016. ↑ "PHC 25th anniversary website". Retrieved December 15, 2009. ↑ Hughes, William (June 27, 2015). "Garrison Keillor's Reign of Terror over America's Airwaves Finally Set to End". A.V. Club. ↑ Justin, Neal (June 18, 2016). "Sun is setting on Garrison Keillor's time on Lake Wobegon". Minneapolis Star Tribune. ↑ Bowermaster, Jon (December 13, 1987). "Fresh Voices Hope to Be Far From Wobegon". The New York Times. ↑ Songer, Marcia (2000). Garrison Keillor: A Critical Companion. Greenwood Publishing Group. pp. 9–10. ISBN 0-313-30230-8. ↑ "Listening Information | A Prairie Home Companion". www.prairiehome.org. Retrieved 2 December 2016. ↑ Sawyer, Bobbie Jean (12 September 2016). "The Country Roots of 'A Prairie Home Companion'". Wide Open Country. Retrieved 2 December 2016. ↑ Barton, Chris. "Garrison Keillor brings 'A Prairie Home Companion' to a close at the Hollywood Bowl". latimes.com. Retrieved 2 December 2016. ↑ Lee, Judith Yaross (1991). Garrison Keillor: A Voice of America. Studies in Popular Culture. Jackson, MS: University Press of Mississippi. pp. 35, 85. ISBN 087805457X. Retrieved November 30, 2016. ↑ Slotnik, Daniel E. (1 November 2011). "Tom Keith, Creator of Radio Soundscapes, Dies at 64". The New York Times. Retrieved 2 December 2016. ↑ Boeni, Meg. "Mouthing Off: The Art of Prairie Home Companion's Fred Newman". Mental Floss. Retrieved 2 December 2016. ↑ "The Guy's All-Star Shoe Band | Regular Performers | A Prairie Home Companion from American Public Media". prairiehome.publicradio.org. American Public Media. Retrieved 2 December 2016. ↑ Falk, Tyler (August 25, 2016). "'Prairie Home' host announces new house band". Current. Current. Retrieved 2 December 2016. ↑ "The news from Lake Wobegon: more guest hosts likely | State of the Arts". Minnesota Public Radio News. 2011-01-15. Retrieved 2013-10-09. ↑ Kaufmann, Carol (2011-03-16). Garrison Keillor Announces Retirement. AARP Bulletin. Retrieved March 18, 2011. ↑ Cobb, Mark Hughes (2011-09-09). 'Prairie Home Companion' tour comes to the Amp. The Tuscaloosa News. Page 5 of 5. Retrieved September 9, 2011. ↑ Seel, Steve (February 7, 2015). "Musician Chris Thile subs for Keillor on APHC". Minnesota Public Radio News. Retrieved February 9, 2015. ↑ Charlton, Lauretta. ‘A Prairie Home Companion’ Gets a New Host — and Maybe a Future. Vulture (June 30, 2015). Retrieved July 1, 2015. ↑ "American Public Media, Nation's Second Largest Public Radio Company, Announces it Now Serves 14.6 Million Listeners Each Week, a 14 Percent Audience Increase". PR Newswire. Retrieved January 10, 2012. ↑ American Public Media. "Podcasts". prairiehome.publicradio.org. Retrieved April 19, 2014. ↑ Carr, David (July 23, 2005). "Lake Wobegon Goes Hollywood (or Is It Vice Versa? ), With a Pretty Good Cast". The New York Times. "Garrison Keillor's Radio Show". BBC 4. "Radio's enduring appeal". BBC. January 4, 2007. "Sun is setting on Garrison Keillor's time on Lake Wobegon". Star Tribune. Minneapolis. June 19, 2016. "Archive.org has full PHC shows from 1981 to 1995".